Never before has there been a better time to reach consumers directly. But the bar to reach them has also never been higher, with two million blog posts published each day. 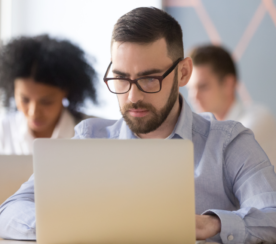 They’re being bombarded by blog content all day, everyday, and, as a result, attention spans have never been lower (less than a goldfish, even). 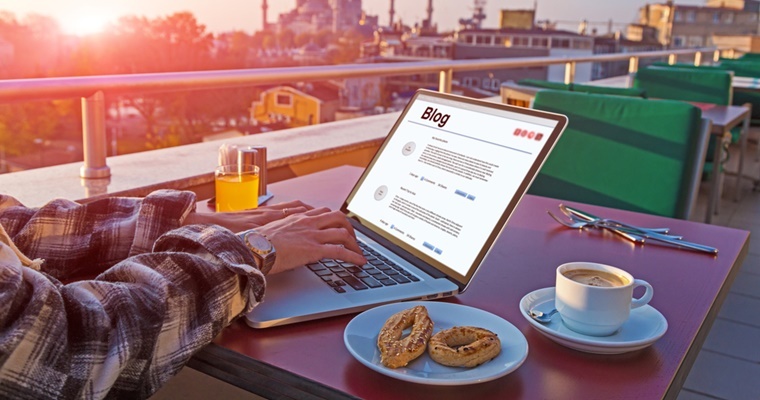 The trick is to make your brand’s blog posts (a) entertaining enough to stand out from the crowd and get attention, yet (b) possess enough commercial intent to also support your business objectives. Fortunately, there are a few shortcuts you can implement to repeatedly save you time and drastically increase your odds of standing out. 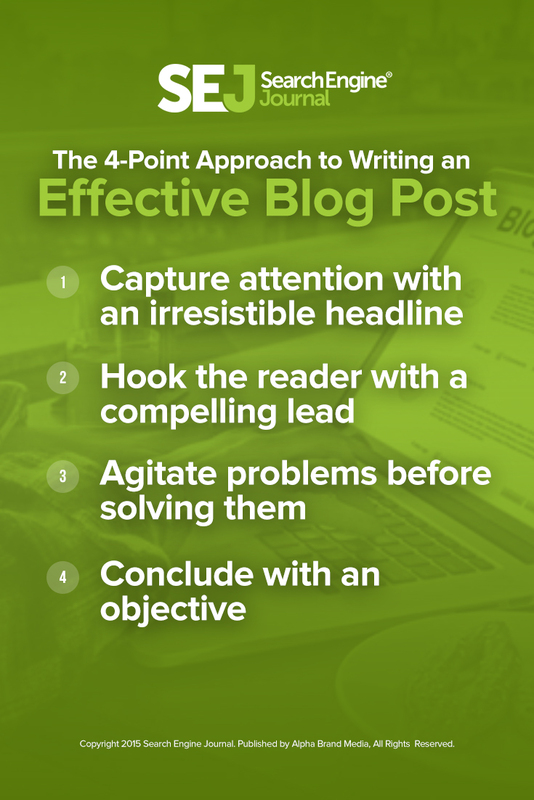 After reading the next few sections, you’ll know how to craft an effective blog post start to finish, giving your content a fighting chance in the crowded online environment. As much as we’d like to believe otherwise, people do buy books based on their cover. And they buy wine because of the label. Wine snobs everywhere just groaned, but that’s what a good brand does. It creates a mental shortcut for consumers, which helps them choose in the face of overwhelming choices. 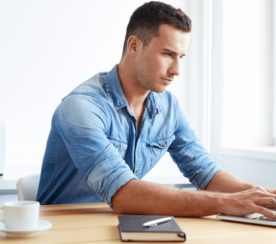 When it comes to online content, it all starts with your headline. It’s the easiest way to quickly get a lot across with a few succinct words. 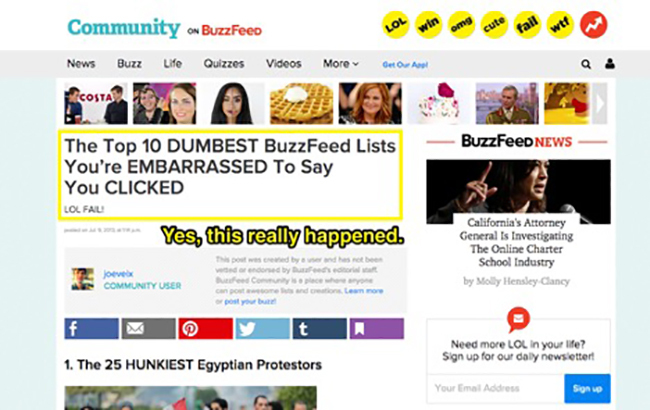 However, the best headlines for commercial content aren’t just ridiculous BuzzFeed listicles. Instead, the best commercial headlines play on a deeper, almost primal motivation to capture attention. The trick here is that you’re not selling topic XYZ, you’re talking about. You’reselling the end result or outcome the reader gets (remember that whole benefits, not features thing?). Thankfully, there’s an amazing free resource at Headline Hacks that will provide a few templates to follow. 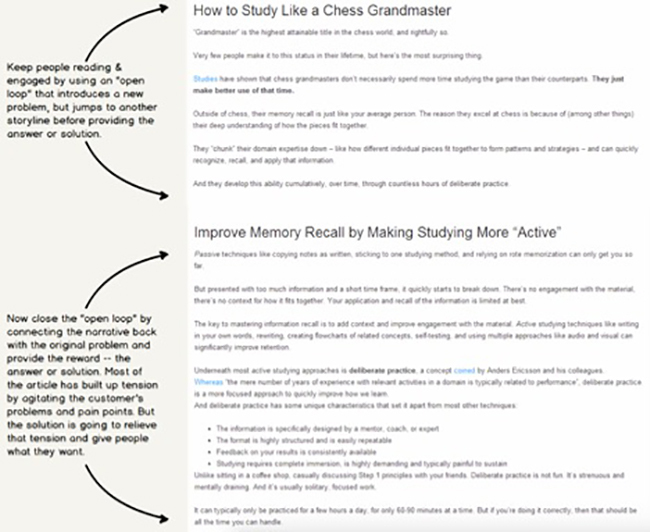 Here’ a few quick examples from our own blog. The best way to grab attention is through negative messaging. Help protect people from external threats they might be encountering. Related to the previous example, where you’re providing a tutorial overview or tactical step-by-step approach, like how this agency used personalization to grow its business. The job of the first line in an article or blog post is to get you to read the second line… says every lame copywriting book. Journalists call this passage the “lede” (the douchey version of “lead”), and it helps you quickly establish what the story’s about before diving into the useful stuff. The idea is that once your headline’s done its job of piquing interest, you have a few seconds to follow-up and build anticipation for what’s to come. Here are three tried-and-true approaches. When people are continuously bombarded by messages and their attention span is almost nonexistent, storytelling helps to provide a simple vessel to get a point across and help people remember it. Anecdotes work the same way, albeit from a personal point of view. In this post, Joanna Wiebe opens with the Brady Bunch. Yes, the Brady Bunch. People read that, and immediately everyone starts nodding their heads in agreement saying, “Yes, Peter was a silly man”. Depending on your audience, pop culture references can be a big hit. Especially ironic, hipster-esque ones like the Brady Bunch (and I mean that in the best way possible). One of the best ways to stand out is to literally stand out. Creating cognitive dissonance by using “pattern interruption” can help you break the mold of what people are expecting to see, which creates intrigue and interest. You can also create pattern interruptions by using “open loops”. For example, simply asking a question without answering can help you skyrocket email responses. Think about one of your favorite sitcoms. Writers create several story lines that intertwine, so instead of finishing one before starting another, they leave “open loops” that keep the viewer interested and engaged to see how it all connects at the end of the day. For example, Tracey and Jenna get into some crazy argument. But before we can see them hash it out, they cut to Jack and Liz in the writers’ room. People only pay attention to what they care about. You can’t force them to consume your content or share your posts. And people only buy (as in “purchase” or “buy-in”) when something touches or affects them emotionally (no matter how compelling your ROI spreadsheet is). How’s this for an example? 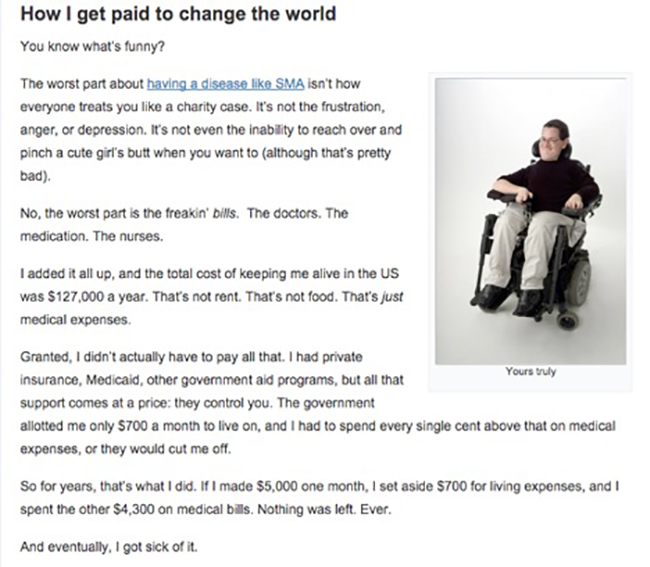 A personal story that people can empathize with, like overcoming the odds with a debilitating disease and struggling to keep up with medical bills. What kind of heartless person wouldn’t read that?! Want to see all of these in action at the same time? Read this, be amazed and I dare you not to sob like a baby. What do bad blog posts and bad first dates have in common? They go straight for the sale. When writing effective blog post copy, don’t forget the foreplay. Build tension, then release. Diving straight into the “solution” without proper build up, slow jamz, dimmed lighting, and a bubble bath prevents casual readers (who don’t understand a topic like you do, and who are probably multitasking already) the chance to understand and empathize with what you’re saying. The easiest way to start addressing your premature solutions is to start with the Problem, Agitate, Solution (PAS) formula. To illustrate, we’re going to use some examples from this case study that covers the creation of this blog post for a client. First and foremost, you need to address the root problem head on. These are typically some form of outcome or end-goal that someone won’t be able to attain unless they read the rest of your article. For example, you can state the problem to build interest, but then add additional context (agitate the pain points) to help people understand what they’re dealing with. Now that readers identify the very same problem in their own lives, you can address issues and pain points caused by the problem the reader is probably already experiencing. These symptoms cause the reader’s some level of discomfort, and by agitating them further the reader becomes aware that a solution may be necessary. 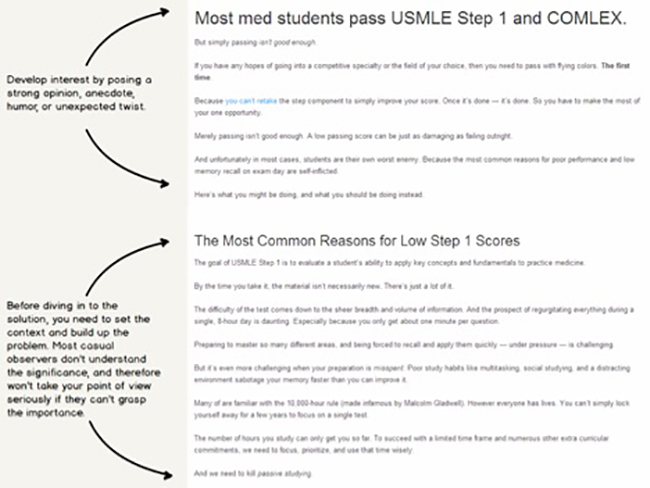 You can even use an Open Loop before introducing the solution to keep people guessing and reading longer. Only when the reader knows there’s a problem can you help solve it. You have the reader’s undivided attention, so your explanation and solution will resonate more. Here’s where you lay out the specific steps or actions it will take to solve the problem and attain the original promise. You’ve grabbed attention, opened with a bang and avoided the awkward premature solution. Now all you have to do is close the deal. You summarize the main points of the article, wrap up the tiny details and then…? Wrapping up a post is straightforward. 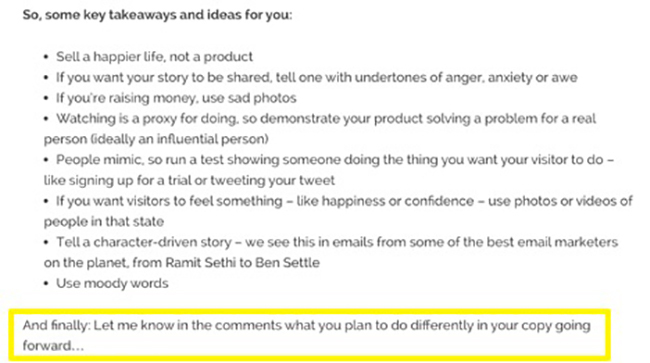 You’re highlighting key takeaways and giving people something to do (whether that’s explicitly or implicitly). Ultimately, you need to figure out what you want readers to do now? You have them baited and hooked, so what’s the next step? It’s NOT “click here to buy XYZ”. Most people reading blog posts are at the beginning of a relationship. So while they might be aware of the problem or need in their lives, they’re not quite sure about you yet. 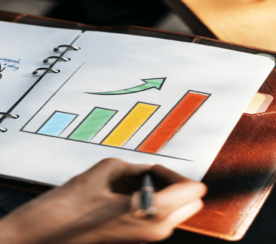 Getting readers to take even the smallest step initially is tough, but worthwhile, because engagement builds trust (which is required to sell). And bringing attention to a benefit they experience (as the result of your advice) will do more to build trust that you’re credible, legitimate, and worth investing more into. Alternatively, your primary call to action (CTA) could be a way for readers to get more information on a specific topic, which will help them achieve a desired outcome or avoid an undesired one (the very same one they just spent five minutes of their lives reading about). 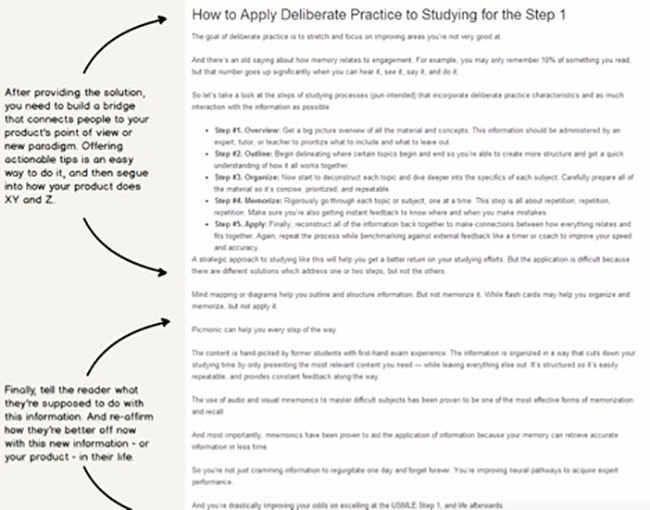 For example, you can read all about these three copywriting formulas. Then at the end, there’s a simple, relevant way to get even more on the topic by watching a webinar recording. 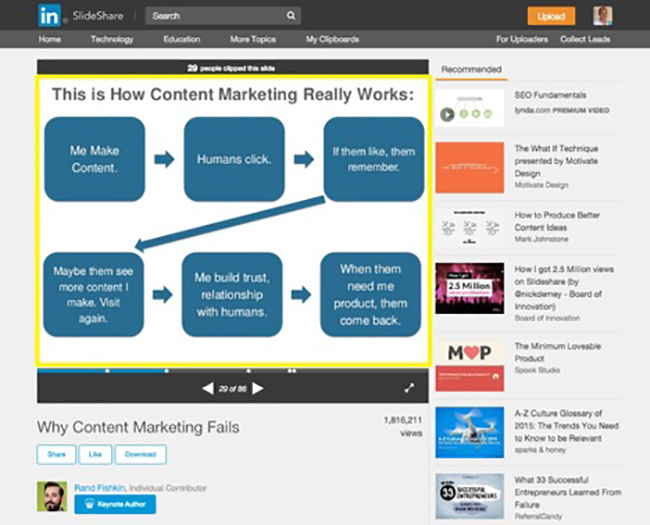 This is right from HubSpot’s content mapping playbook. First a blog post brings in a new visitor looking to fix a problem. Then a webinar engages the visitor deeper. Last, but not least, a pricing comparison or demo can help the visitor see the value your solution provides (relative to alternatives). Now instead of 99% of your website visitors bouncing, you’re able to start building a relationship by nurturing your leads until they’re ready to talk. 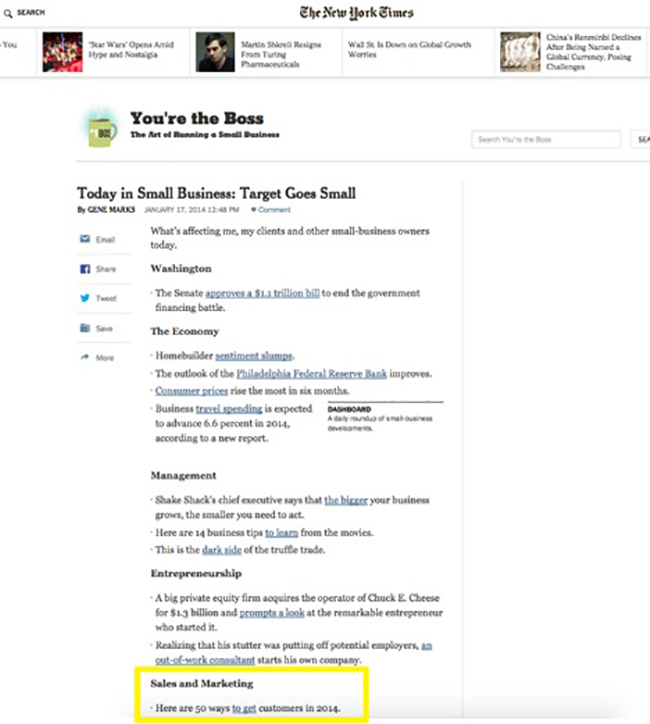 And once in a rare while, the heaven’s will part, the light shines down, you get a link from The New York Times and a few weeks later it directly delivers a customer worth $25,000+. The best part here (besides that I’m almost done talking) is that you don’t have to possess some mystical creativity DNA strand in order to create compelling online content that builds your business. Content marketing fails for other reasons (see slide 29 here). Instead, you need to understand your customers and audience. Figure out what they like and dislike. Then talk about those things. Consistently. You don’t have to pimp your brand every second. Or talk about your boring company’s un-unique features. Every other one of the two million blog posts published today already has that covered. The best way to stand out is to simply to care about your customers and what they’re going through. Then make it clear to them via blog posts that you understand. And you’re here to help. All screenshots by Brad Smith. Taken February 2016.